Art of the South is a group of galleries (we call it a family of galleries) owned and managed by Dave Smith, his wife LeeAnn and by Jim Odom and his wife Linda. We opened the first gallery in Cleveland, Tennessee in June of 1997. Since then we have opened galleries in 15 cities in 5 states. You, the customer, sometimes have no way of knowing who you are dealing with on the internet. Someone selling art from his basement can produce a professional looking web site and convince you that he has a legitimate business. It is important to know the company you are doing business with. We have “brick and mortar” locations and a central office and warehouse to provide you, the customer, with the best in customer service. 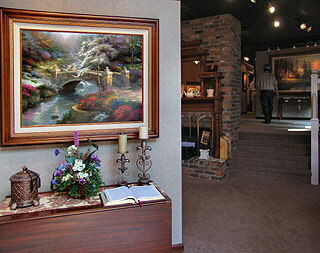 Most of our galleries are Thomas Kinkade Signature Galleries. 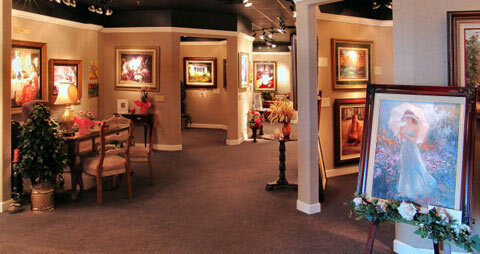 Perhaps you may be wondering just what being a Thomas Kinkade Signature Gallery means? Well, the title of Thomas Kinkade Signature Gallery indicates that our Thomas Kinkade galleries carry only Thomas Kinkade art and themed products. It also means that we are authorized to carry exclusive editions of Thomas Kinkade’s artwork that quite simply cannot be found anywhere else. The serious Thomas Kinkade collector knows that to see the largest and most complete array of Thomas Kinkade art, they must visit a Thomas Kinkade Signature Gallery whether they are looking for Standard Numbered Editions or the extremely rare Studio Proofs. Please do not let the exclusiveness of our galleries lead you to think that we are snooty or so corporate that we hide behind a maze of phone systems or fancy features that keep you from hearing a human voice when you call. We here at Art of the South are full believers in “Southern Hospitality”. We promise that when you contact us, there will be no call centers on the other end of the line nor a “fast food like” atmosphere at our galleries when you come visit. What you will find though, are caring and friendly people who love to do one thing - talk about Thomas Kinkade and his works. There will be no double speak or high pressure sales pitches; instead it will be as comfortable as talking over apple pie at your Sunday social. We also have included galleries in our Art of the South family of galleries that carry quality artwork done by other nationally known and acclaimed artists. By including these galleries, you our customer, can expect to find everything the world has to offer in fine art. Art from many of the finest publishing companies in America are featured at one of our galleries. You will find a directory of our physical locations at “Contact Us” . On the web, you may find us at ArtOfTheSouth.com, Shopping.ArtOfTheSouth.com, ThomasKinkadeStore.com, KinkadeOfTheSouth.com, LamplightGallery.com, or MastersEditions.com. All are a part of our family of galleries. Rest assured that you will get the best in customer service whether you make your art purchase on line or at one of our galleries. It is our belief that if you are truly looking into investing in a piece of fine art, then you should go into such an acquisition knowing all of your options as well as a little bit about the image. Whether you call or walk into one of our Art of the South galleries, you will be paired with an Art Consultant whose main job description is to make you happy. This Consultant will answer your questions, send any information you request as well as help you find that perfect canvas for your home or office. When you deal with an Art of the South gallery, its always a win win situation. 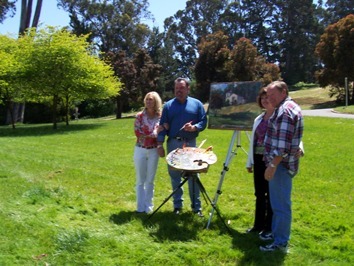 While successfully owning and operating several ChemDry franchises in California, Dave and his wife, Leeann, were introduced to Thomas Kinkade’s artwork. It was Thomas Kinkade’s unique themes and use of luminescent colors that left a strong impression with the couple causing them to consider ways to share the work with others. 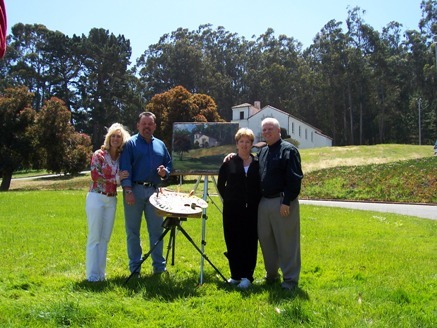 So in 1994, Dave Smith met Thomas Kinkade while Thom was painting on site in Carmel, California. Dave was so impressed with the ability of Thomas Kinkade that he started a Thomas Kinkade gallery in Morro Bay California, one of the very first galleries to feature only Thomas Kinkade art in the world. Close friends of the Smiths, Jim and Linda were enjoying the success of Jim’s real estate and construction ventures as well Linda’s nursing career when Dave insisted that they must open a gallery in Gatlinburg. This would be the perfect location to help spread the Light of Thomas Kinkade’s message. No one in eastern Tennessee had ever heard of Thomas Kinkade. In June of 1997, the Odoms responded by opening a gallery in their hometown of Cleveland, Tennessee. At the time, it was the 13th Thomas Kinkade Signature Gallery in the US and only the second one opened east of the Mississippi River. Since that time, Smith and Odom have opened several other galleries, including four in the popular tourist city of Gatlinburg, Tennessee, and two in Pigeon Forge, Tennessee. Julia and Kristen are the Odom’s two daughters. They play a big part in the business. As a matter of fact, Jim has stated on more than one occasion that he did not have a boss until the girls came to work for him. Julia is the CFO of the company and Kristen is the Director of Operations. 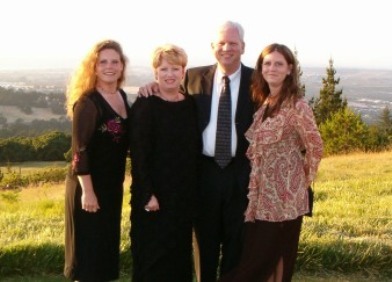 Pictured left to right is Kristen, Linda, Jim, and Julia.